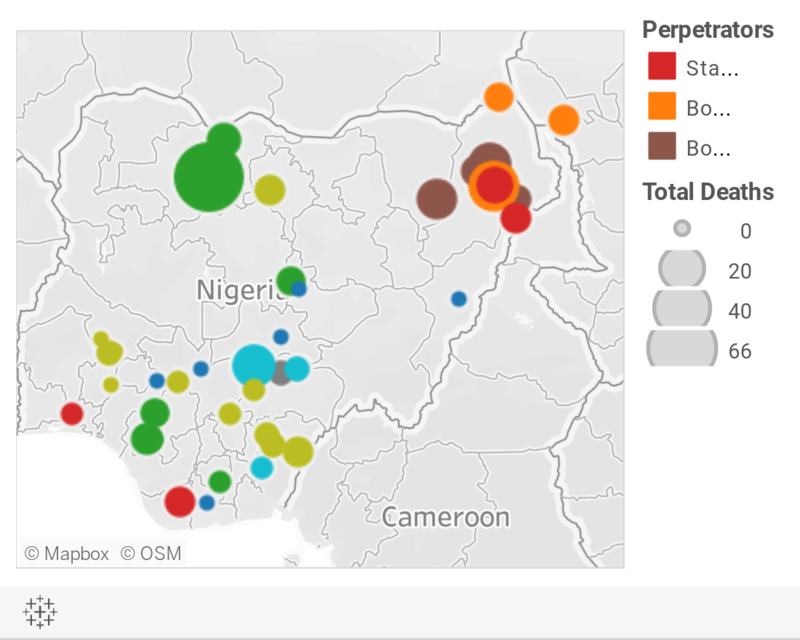 Below is a visualization and description of some of the most significant incidents of political violence in Nigeria from February 16 to 22, 2019. This update also represents violence related to Boko Haram in Cameroon, Chad, and Niger. These incidents will be included in the Nigeria Security Tracker. February 16: Four Boko Haram suicide bombers killed themselves and seven others in Maiduguri, Borno. February 16: Boko Haram killed three and kidnapped twelve in Gwoza, Borno. February 16: Five Boko Haram militants, four Nigerian soldiers, and five civilians were killed during a battle in Gujba, Yobe. February 16: Two People's Democratic Party (PDP) supporters were killed in Izzi, Ebonyi. February 16: Five were killed in election-related violence in Etung, Cross River. February 16: Boko Haram killed six Nigerian soldiers in Magumeri, Borno. February 16: Seven soldiers and "many" (estimated at ten) Boko Haram militants were killed during a clash in Nganzai, Borno. February 16: Two Nigerian soldiers and two Boko Haram militants were killed during a clash in Bama, Borno. February 17: Gunmen killed the Benue local government All Progressives Congress (APC) chairman in Ohimini, Benue. February 17: Bandits killed six civilians and one soldier in Batsari, Katsina. February 18: Boko Haram killed eighteen in Jere, Borno. February 18: The Nigerian Air Force killed "some" (estimated at five) Boko Haram militants in Gwoza, Borno. February 19: Two were killed in election-related violence in Oyun, Kwara. February 19: Gunmen killed an APC ward chairman in Ngor Okpala, Imo. February 19: Boko Haram killed five and abducted nine in Bouboura, Chad. February 20: Herdsmen killed seventeen in Agatu, Benue. February 20: The Nigerian Air Force killed an unspecified number (estimated at ten) of Boko Haram militants in Jere, Borno. February 20: Fifty-nine bandits and seven civil defense fighters were killed in a clash in Chafe, Zamfara. February 20: Nigerian soldiers killed two herders in Makurdi, Benue. February 20: Gunmen abducted eleven in Emuoha, Rivers. February 21: Five were killed in election-related violence in Bebeji, Kano. February 21: Sectarian violence led to two deaths in Guma, Benue. February 22: Boko Haram killed an unspecified number (estimated at ten) of civilians in Jere, Borno. February 22: Boko Haram killed four in Bosso, Niger. February 22: Two were killed in election-related violence in Ikwo, Ebonyi.